Educating, consulting, inspiring, influencing, motivating and assisting channel partners to participate in b2b communication and opportunities can be exasperating. Partners don’t always have the time to answer every phone call, respond to every email or sit down for every cup of coffee. However, blogging, yes blogging, is one of the most effective—and sorely underutilized—channel marketing strategies that actually improves partner enablement. And if you happen to be struggling to motivate your network, or not using a blog in your channel marketing, now—more than ever—is the time to do so. The results will amaze you! 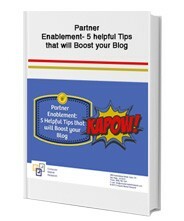 Receive a Free whitepaper on “Partner Enablement: 5 helpful Tips that will Boost your Blog” by filling out the form on the right.